With Forge World releasing their new Imperial Navy Avenger Strike Fighter, I thought I might look at this one and the Thunderbolt and share my ideas for how I might go about converting an Imperial Guard Valyrie into them. 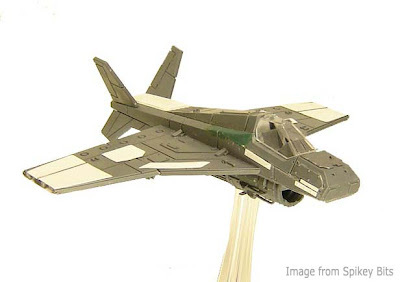 That's right, take the standard IG Valkyrie model and turn it into one of these fighters. It might not be quick and easy, but I bet it could be done without an impossible amount of work. Now mind you, my conversion is just an idea, but after looking at the sprues for a Valkyrie, I honestly think it could be done. I hope someone tries to do something like this as I really would like to see how it comes out. I would try it myself, but that's not really possible right now. I remembered seeing this conversion done by Rob over at Spikey Bits a while ago and it reinforces my belief that it can be done. 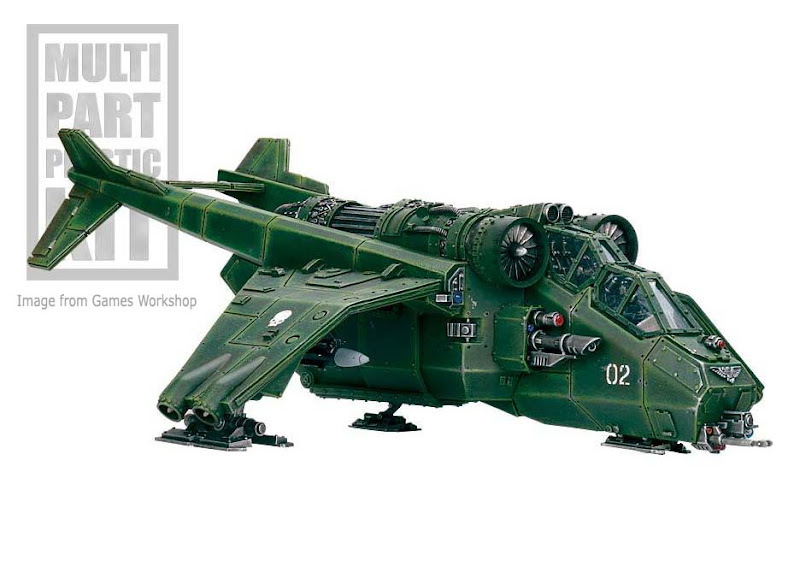 Sure, it wouldn't be an exact replication of the Forge World model, but I think you could get pretty close to an Avenger. Close enough that folks would recognize it for what it should be. 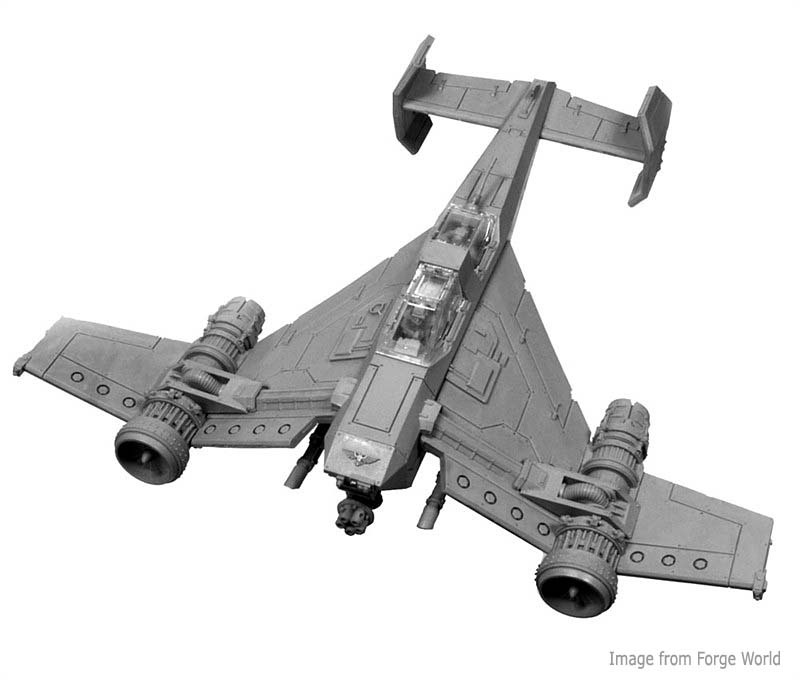 This is a great conversion using parts from a Valkyrie to create a non-descript Imperial fighter. Even if you used this approach and inserted the engines into the wings at the half way point, you'd be pretty close to having an Avenger Strike Fighter. Maybe fiddle with the angle of the wings to give them the same bent look look as the actual model and rework the tail section to get that dual tail wing look and you'd be all set. After that, it'd be the smaller details that brought it to life and really closed the deal. Here's the one I'd really like to see done. The Thunderbolt Heavy Fighter. 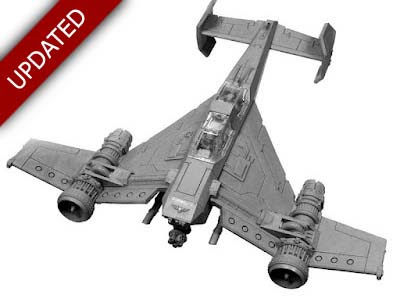 This one would take some additional plasticard work above and beyond the little bit an Avenger would require. But again, I don't think it's impossible to do. I think the biggest thing with this one is creating the bulked out engine section. Dare I say this one might even be easier to do since you can hide so much with the engine cowling. I really like the look of this one and if I had to build only one, this is the one I'd go with. I have no idea how well this one performs in the game, but this thing just looks mean. As I went looking through my old IA:1 to see what the stats were for the Thunderbolt, I came across a few rules that I hope are included in the new Imperial Aeronautica book. 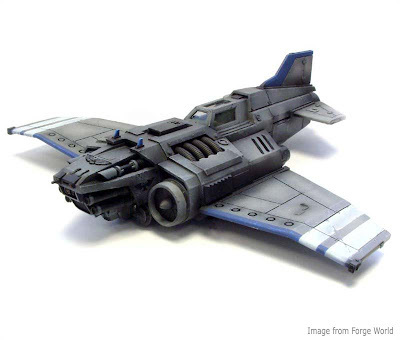 Things like ejector seats, armoured cockpits and distinctive paint schemes. Some of these are pretty cool and I'd love to see someone model up their fighter pilot for the times he gets shot down. I've already got my downed pilot ready to go. I made this guy a while ago as an objective marker since I thought rescuing a downed pilot made for a pretty cool objective. 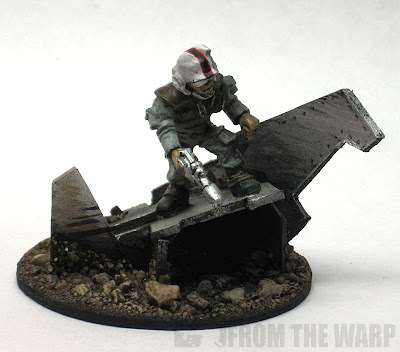 He's nothing more than a really old Guard model on top of a few pieces of cardstock stuck into the base and painted to look like jet wreckage. In the comments below, Nuclear left a comment about how he did this very thing using a Valkyrie, some plasticard and a few extra bits. This thing looks gorgeous. Now I really want to try my hand at making one. That conversion seems to be pretty doable. The only place I can see the being problems is the engine, and the tail. Love the downed pilot objective! I've always been a huge fan of the Thunderbolt, and have been hoping against hope to see a plastic version of the kit for my guard. I've owned several resin ones over the years and it's just a beautiful model to build and paint - with the new 6th ed. flyer rules it's tempting to get another one! Almost entirely built from the Valk kit and plasticard, with some SM and IG weapons and vehicle bits thrown in. Narric: Depending on which flyer you try and copy, different areas might be problematic. But you're right, it's doable. Mordian7th: Thanks. Sounds like the Thunderbolts do well for you then if you've got a couple of them already. Nuclear: That's it exactly! Well done Sir! Sold. This is my next project. My hydra DIY can wait. Anyone know a good way to upload .pdfs so I can post them to my blog? Myles: You better email me pics once you're done! Holy cow, whoever sold me this used Valkyrie needs to be shot. Not lethally, just in the leg so he knows I'm pissed at him. Converting up the Avenger now, I've had to alter my plan four times because I couldn't separate parts without breaking the model. There's gonna be a lot of green stuff work involved, but at least 99% of the model is coming from the Valk kit. dwez: Those look incredible. I'd love to see any plans on how those were done. Zab: The biggest thing with this post was the cost savings. You can do it with a Valkyrie and save the money, but you'll pay in time it takes to build it. As for weight, you make a good point, the converted models are probably a bit lighter too. Myles; Best of luck with it. Hopefully it's not too hard to work with. 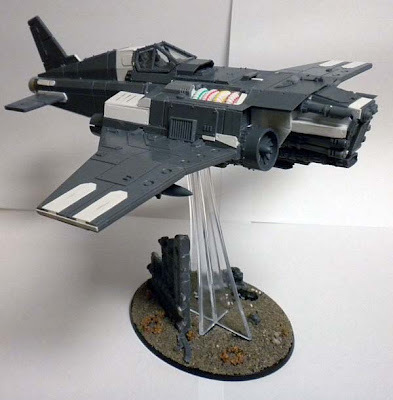 Here's an Avenger conversion that a friend of mine did using an Ork Bommer, a Punisher cannon and two Las-cannons from the Storm Raven. Simple but effective. Hudson: That is nice and simple. A bit old school looking too... not the new, angular feel like Forge World seems to do all the time. jim: Hudson's link in his comment shows that very thing. It's a bit rougher looking in some ways because it comes from an Ork kit, but it's a completely doable thing at the same time. It gives the model a more desperate look that may fit in with the who lost technology, found STC, machine spirit kind of thing as opposed to the more refined and finished look the FW version has. jim: I'd have no trouble with it. You can always think of it as one of the many versions out there. While they may have the STC for the fighter, they may not have the materials or equipment to make it exactly as spec'd. Cool, glad soneone found it useful!